My favorite 3D architectural modeling software, Chief Architect, will soon release a new version of the program, version X4. No release date has been announced yet, but rumor has it that it will be sometime this summer. UPDATE: Chief X4 was released in July 2011. What’s the difference between a 3D render and a raytrace? When I’m discussing a project with a new client, I often get asked what the difference is between a “render” (or “rendering”) and a “raytrace.” Sometimes I use all three terms interchangeably, which I’m sure can be confusing. But are they actually different? If so, how? Answers to these questions could (and do) fill entire books and webpages, but I’ll attempt a very simple explanation here (which will still be way too technical for a lot of folks!). Computer rendering* is a general term for producing an image from a model constructed with 3D modeling software. 3D modeling involves creating a mathematical representation of a three-dimensional object. Once the model, or mesh, is created, it is possible to take a “camera view” of the object from any angle (hence the term 3D). The information from the 3D model is transferred to a rendering program to be processed and output as a digital image file, typically using a simple rasterization or scanline rendering method. Current processors can produce this type of rendering quickly and efficiently, pretty much in real time, and it is what is used in most computer gaming. Raytracing is a specific type of rendering technique. The name refers to the way the computer creates the final image — by analyzing the light sources in the scene and computing the paths of the rays (photons) produced by those lights. The result is a very realistic image including reflections and caustics (light refractions through glass), resulting in lighting and shadows that are close to what would be observed in the real world. Raytracing algorithms simulate light realistically as it bounces between different objects, calculating the exact color of each pixel based on its material properties and the amount of light it is receiving. In raytracing, many different algorithms can factor into the computation of a pixel’s final shade, including the material’s absorption, reflection, transparency, translucency, and refraction characteristics. Raytracing actually proceeds opposite to the way light normally travels, because it works backward, only calculating the paths of photons that actually intersect the camera’s view frame. Although this makes the process more efficient than if it actually traced the path of every photon emitted from every light source in the scene, it does not always yield the most realistic results. Other methods which combine both eye-based and light-based ray paths, such as photon mapping and bidirectional path tracing, can yield superior results, especially in scenes involving indirect lighting or caustics. Rendering is generally less time- and computer-resource-intensive than raytracing. However, technology is improving rapidly and real-time raytracing will soon be an accessible reality. * Of course there are also the time-honored “artist’s rendering” architectural illustration methods such as pen and ink, watercolor, colored pencil, pastels, etc. Nowadays, the look of many of these traditional techniques can be produced using computer graphics and photo-editing software. More on this topic another day. So, are you still with me? What does all this technical stuff mean for someone who wants computer images of their new home or remodeling plans? An example can demonstrate the differences best. Here is a comparison of a render versus a raytrace of the same room. 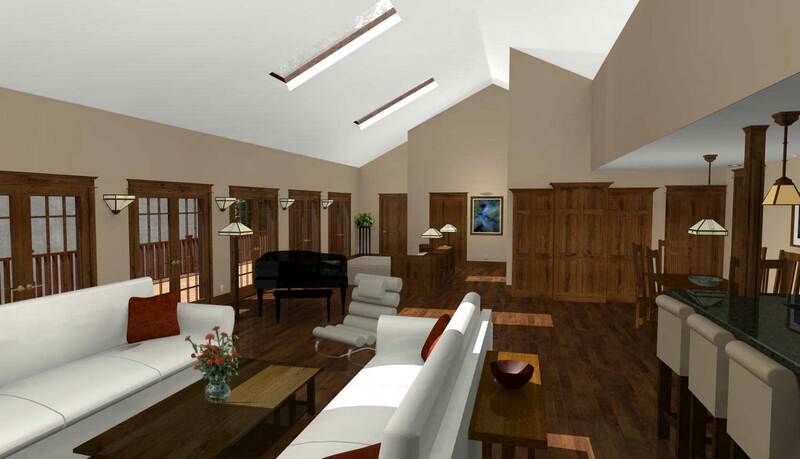 The first image is a Chief Architect rendered camera view of a great room and entryway with curving staircase. The second image is one I posted the other day, a raytraced image of the same space. In the rendering, you can see that there is some differential shading of surfaces depending on their angle and the amount of light they are receiving. But overall the scene looks fairly flat. The lighting in the raytraced image is much more realistic — sunlight coming through the windows, reflections on the polished wood floor, and a greater sense of depth and dimension. You can view another render-vs-raytrace example here. 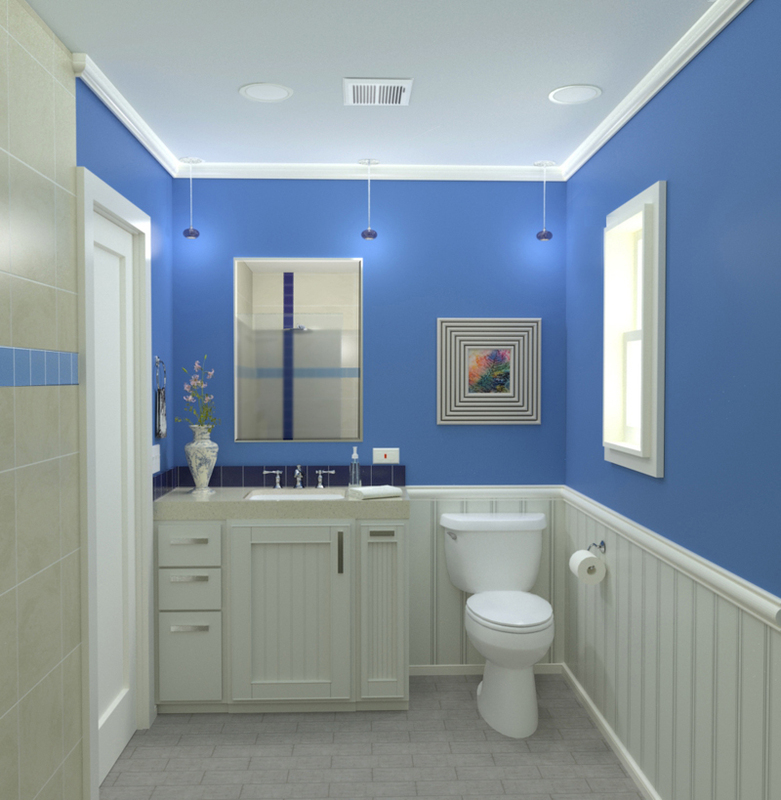 Renders are fine for the initial stages of a project, when rough approximations of the look and feel of the space are sufficient for planning purposes. But once the major decisions have been made, final raytraces are what really bring the space to life and promote confidence in the material and design choices. So there you have an oversimplified explanation of the differences between rendering and raytracing. I was enchanted and enthralled the first time I produced a simple rendering with my beginner-level Home Designer software. But once I learned how to create raytraces with Chief Architect’s POVray, and later on with Kerkythea and Thea Render, it was impossible to feel satisfied with anything less realistic again. My sincere apologies to anyone who is more expert in this area than I am. I’m an intelligent, educated person, but thinking about the technical explanations for all this makes my brain hurt. I’ve done my best to distill a very complicated topic down to a few paragraphs. However, I realize I’m in way over my head here, and I’d be delighted to hear a more correct or complete explanation of the differences in the Comments. When I was first learning to do 3D modeling and rendering back in 2007, I decided to try an exercise that many art students are given in their studies: learning by copying the old masters. With sketchbooks and pencils in hand, students visit the world’s great art museums to learn about an artist’s technique by trying to duplicate it themselves. For my learning exercise, I decided that my “old masters” would be architectural and interior designers whose work I admired. So I gathered a collection of photos from the web, many from Architectural Digest (which is, in my opinion, the best place to see consistently fine examples of both interior and exterior design). I set myself the task of trying to learn something about their design techniques, as well as mastering my own modeling and rendering software tools, by trying to reproduce the photos as 3D renderings. I feel this approach really taught me a lot, and I highly recommend it to anyone wanting to improve their 3D skills. Now that I’ve been at this for almost 4 years, I still occasionally do this exercise, simply because it provides an excellent insight into a designer’s mind to try to understand why they did things the way they did in the building or room I’m studying. Recently, instead of tackling a new challenge, I decided to revisit one of my old favorite inspirations, a lovely room created by awesomely talented interior designer Suzanne Lovell in her own townhouse in Chicago. Her home was written up in a 2007 article in AD (which unfortunately is no longer available online). I liked my original rendering so much that I had been using it for years in my portfolio on the CastleView 3D website, despite the fact that it was a very early example and wasn’t actually produced for a real client. But because the rendering software I use now (Kerkythea) is much more sophisticated than what I was using in 2007, I wanted to see how much the image could be improved simply by using the new tool. I didn’t change my original model except to import it into Chief Architect X3 (to enable VRML export), but instead spent time tweaking the lighting and textures in the imported file within Kerkythea. Below is a comparison of my original image with the most recent one (you’ll need to click to enlarge the images for a decent comparison). You can see that in the 2007 version, the render engine wasn’t able to produce reflections, or even shadows! Of course I’m much happier with the more recent version, although as I look at the final product there are still things I would like to change in my addictive quest for photorealistic perfection. Perhaps I’ll work on improving some of my original modeling, and post an update later. But in the meantime, this new image is definitely replacing the old one on my website!